Solid Sterling Silver Wedding Band. Standard Classic Style Half Round band! 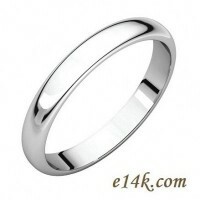 Available in 4.5mm, 5.5mm, or 7mm wide for a ladies or men's wedding band. This classic jewelry style is the perfect simple wedding band. Very Nice, Top Quality, Wedding Ring!! !